Thursday already? Easter Sunday is quickly approaching! No, we still haven’t made plans for the day other than church. It’s been an unexpectedly busy week. As I sat down to write this last night, I found out that my oldest daughter was taken to the ER and admitted for appendicitis. Thank God her appendix did not rupture! Not being able to be with her is… I actually can’t find the words to describe it. It hurts! But I know that God is in control, and thanks to the precious blood of Jesus she can have a fast recovery. So it kinda took me a couple of hours to get myself calmed down and start typing. All I can think of is how thankful I am that the Lord keeps His hand on my family. We’ve had one big blow after the other this week, but I know that God will see us through. I know He will do the same for you as well. He is more than worthy of our praise! That concludes day 4 of our Easter music series. Need to catch up? No problem! Here we are, already on day 3. I’m ready for that revival we talked about yesterday. Are you? Keep praying! So many emotions come with the remembrance of Christ’s death and resurrection. Feelings of sorrow but also of excitement. Let us never forget the price that was paid for us on that cross. He bore it all, just so we would not have to suffer. I can’t wait to see my Savior face to face one day. There will never be enough words to thank Him, and I will spend eternity trying to find them. It’s going to be wonderful! This was a hard song to track down! My Dad has been singing it in church for years. Love it! There are many versions of this old song. But I love anything by Russ Taff, so this is the one I went with. Anyone remember this one? I used to play this over and over on a cassette tape where I recorded it off the radio… Until I dubbed it on to another tape to play 3 times in a row. Still love it. Well, that’s it until tomorrow. 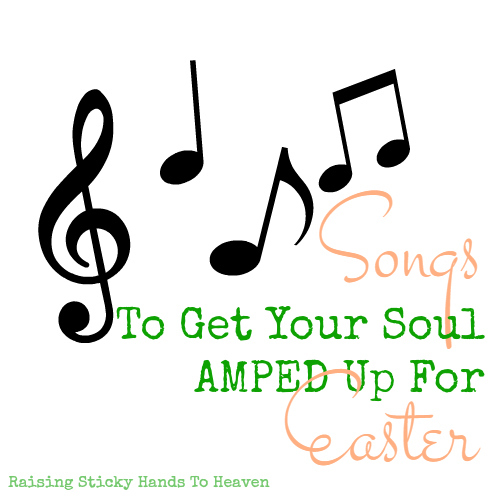 What are some of your favorite songs for Easter? I still have a long list to work through, but would love to know what some of the songs you hold near and dear are. Be sure to check out this post from Jennifer A. Janes last year about A Special Needs Friendly Easter Egg Hunt. Even if you don’t have a special needs child, it is very insightful. Day 2 has arrived! Are you getting excited for Easter Sunday? C’mon, now! I don’t know about you, but I’m praying that this Sunday sparks a REVIVAL for the church as a whole. We sure need it, don’t we? Maybe some music will help… 😉 Let’s do this! Lord, let our remembrance of your death and resurrection, through which we have been given salvation, begin a revival in our hearts and in our churches. Let us all return back to you, our first Love. In your mighty name we pray! Amen! Keith Green was one of those ministers that has continued to minister even decades after his death. His testimony, songs, sermons, and writings are still relevant today. If you want to be inspired and motivated to reach the lost and make a difference, I highly suggest looking up more information on Keith Green, his wife Melody Green, and Last Days Ministries. But yeah, you can’t have Easter without Easter Song. I mean, self-explanatory. I’ll never forget the first time I ever heard this song. I was a few months pregnant with Tommy (so nearly 8 years ago) and had parked at a Long John Silver’s because I was really craving fish for some reason. The DJ announced that Casting Crowns had just released an awesome song and to listen closely to the words. I had only repented a few weeks before, and was still dealing with a lot of guilt. I was sure that the things I had done would never be fully forgotten by anyone, including God. I was supposed to go to church a few hours later, but was so close to chickening out because I felt unforgivable. Cue this song… My fish was cold by the time I was done crying… and I went to church. Thank you, Lord, for Your grace and mercy! Another one that has obviously been sung by many people, but this is the version I chose for this post. Whew! That’s it for today… Be sure to come back tomorrow! Oh yeah, there’s more. A LOT more! Keep praying for that revival. It starts with each and every one of us. Are you looking for some fun DIY decor ideas for this weekend? A few years ago Stephanie shared these fun projects over on her blog, Crayon Marks and Tiger Stripes, for Jesus Eggs and a Cross Button Frame. So cute! Click the links below to find out more. Can you believe we are at the end of March already? It sure doesn’t seem possible! Like I mentioned on Friday, Resurrection Day (Easter) is more and more becoming my favorite day of the year. In the same way that I love to listen to Christmas music in December, I love to listen to songs about what Jesus did for you and me in the Spring. Well, all year actually. But you know what I mean. During this time of year, I can’t get enough of these pieces. I was going to organize them by style and all that, but decided in the end to just throw them up randomly. Enjoy! There are 2 versions of this song. Actually, 3, since both songs are based on an older hymn, but we’re going to go with the 2 newer ones. There is the upbeat Gospel style of Donnie McClurkin that many of us grew up hearing in the 90’s. Then there is the softer version by Casting Crowns that came out a few years ago. So today, for 1 song, you get a two-fer! This version is by Jars of Clay. Emily wrote a post about this song a few years ago. You can read that by clicking here. I’m not quite sure who sang this song first, but I grew up hearing it every Easter and absolutely love it. Larnelle Harris makes another appearance on our list, because wow, he hits those notes!